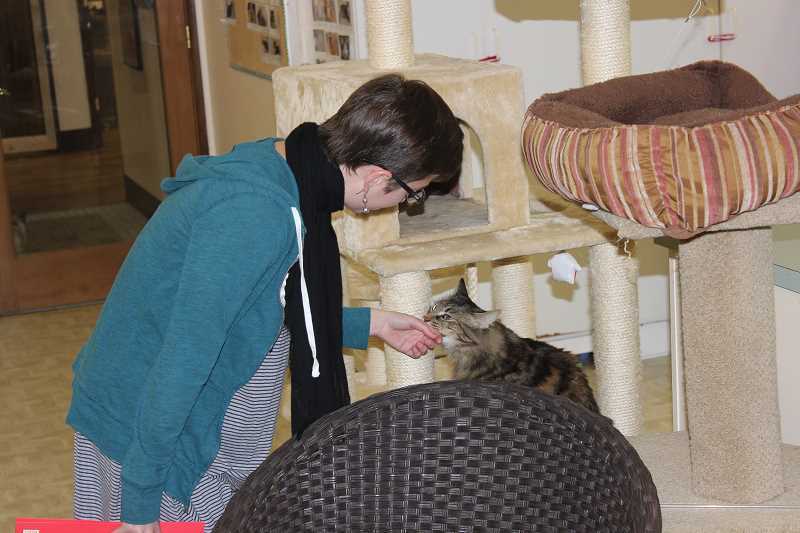 After moving into its current Southwest Portland home in the 1990s, Animal Aid has implemented occasional minor renovations but has largely remained unchanged. Now, as Animal Aid Director of Operations Paige O'Rourke puts it, the organization is undergoing "its moment to refresh." The nonprofit animal rescue organization, located at 5335 S.W. 42nd Ave., has begun a $300,000 remodel that it hopes will increase the shelter's rescue capacity by 25 percent, provide a more welcoming environment and strengthen its current services. "Being able to take in more animals will be excellent. I think the quality of care animals get now is excellent, but we're definitely going to make it an even better environment for them and for people to come in, interact with our cats and feel like this is a really welcoming and accessible space. And then also the staff's ability to continue growing and improving the organization overall," O'Rourke said. Animal Aid has a free-roam facility for cats, a foster program for cats and dogs and also manages an Animal Aid Cares program to provide funding for urgent medical care and a canine spray and neuter program. "Our animals don't live in cages while they're with us. They're happy and they have that lifestyle that's really great for them. We also don't do same-day adoption. Our adoption process is really structured to make sure we find the best match for the animal and the person," O'Rourke said. Phase one of the remodeling process, which is underway, includes adding two isolation rooms for cats who require a different diet than the free-roaming cats, have a medical condition or are being examined to determine if they're sick. A meeting room, an improved laundry room, a bathroom and an emergency dog kennel are also being added. All of these facilities will be located below the main office. The second phase of the renovation is scheduled for completion in 2019, the 50-year anniversary of Animal Aid. It will include three new cat suites, improved current spaces, new windows and renovated offices that will increase accessibility between cats and clientele. "This space will actually be a part of the lobby," O'Rourke said of her office. "We will create a big window here where our closet currently is, so people can see right into all of the cats' faces and immediately be able to interact and feel welcomed." The nonprofit will also renovate the exterior of the property — replaceing rose bushes with more greenery and adding a sidewalk. Animal Aid has contributed $75,000 of its own money to the renovation and hopes to raise the remaining $225,000 via donations and grants. People who donate a certain amount of money to the renovation of a particular room, depending on the cost of the room, can name the room. The baseline price for naming rights to a room is $5,000; donors can also earn naming rights to the cat suites with $1,000 donations or earn a spot on the organization's donor wall. "Whatever people are willing to donate, that helps us to cover that cost and be able to take care of more animals," O'Rourke said. For more information, visit the Animal Aid website at animalaidpdx.org.